Perhaps this is one book where the material is subversive enough that I understand why there are elements in this world who would like to see this banned. And for that reason, also for the reason that I came across this novel by virtue of seeing the list of 1000 novels that people should read in their lifetime by The Guardian, I decided to pick this up from the library. This novel presents a rather thinly fictionalized account of the assassination of Greek politician Grigoris Lambrakis, who was murdered by elements of the Greek junta in 1963. You could read about the real murder online, but let me write how the novel presents it. The book begins with an agricultural meeting about pollination. This is held by right-wing elements. After that, the events about a rally that will be held by the left-wing population are narrated, where Z is supposed to give a speech. 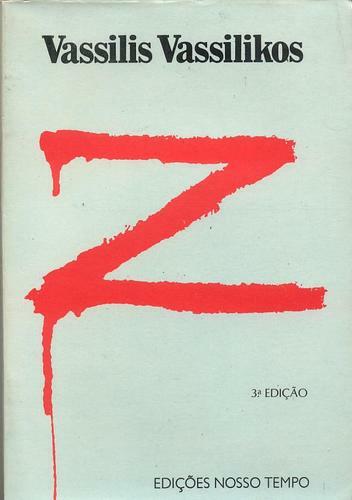 At the same time, the reader is made aware that elements of the police force are hiring thugs and hoodlums to murder Z by bludgeoning him with a club. All the events leading to Z's death is narrated using different perspectives and different narrators in Part 1, entitled An Evening in May, from 7:30 to 10:30. Part 2 is a short one, consisting of one chapter, entitled A Train Whistles in the Night. This narrates the funeral of Z, as a train transports his coffin to his final resting place. After the Earthquake is Part 3, consisting of the investigation that follows. There are reporters and investigators from both sides, and we see how the stories of the police force don't add up together, and people are living in fear because the police force basically controls everyone else's livelihood. Parts 4 and 5 (Apologias and One Year Later) shows the end result: the police force are put to trial, and yet justice is still not served. The book's ending is pretty downbeat, and yet realistic in my opinion. After all, this isn't a fairy tale, and politics isn't a fantasy that would end in something along the lines of happily ever after. I could understand why this book would be banned in Greece, and why Vassilikos would be forced to go to exile. After all, he is portraying the right-wing military junta that reigned in his country during the 60s and 70s in a negative light. Thus, in my point of view, this book adds to the plenty of books that portray a dystopian environment, somewhere where everything is controlled, including how we think. Truths are all relative, people twist news reports so that everything that gets published is favorable for them, and people buy other people so that they wouldn't testify against them. Unfortunately, for this dystopia, it wasn't set in the future. It was set in Greece some 50 years ago. I suppose what I find awesome about this book is less about the literary aspects of it but more about the content. If my political beliefs were to be categorized, I'd probably be less of a match with the right-wing political ideologies than with the left-wing folks. The thing this book is very good in portraying is the fact that there is a small ruling class, a military junta, where all the riches go, and the rest are poor and illiterate, surviving on a few drachma a day. This scenario just makes Communism so lucrative, because it (ideally) equalizes the wealth. Granted, I ultimately believe that man is inherently selfish and therefore this equalization of wealth won't happen, but I do acknowledge why Communism would be the first, albeit radical reaction against corruption. So, would I recommend this? Definitely. It's hard to get a copy, I searched online bookstores and it seems that it hasn't been in print lately. Good thing my library had a copy of the 1968 English translation printing. I would give this 4.5 out of 5 stars. Very nicely written, Jeruen. I think you can be one of those celebrity book reviewers! Oh, it's you? Why hello there!